The Internet is a crucial medium for the advertising business, but it is also used by shady third parties that want to get rich at your expense. And it is often exploited by adware applications like Best Save. Perhaps it would be too far-fetched to say that this adware application tries to cause you harm, but the problem is that Best Save could be easily exploited by cyber criminals. Hence, if you want to protect your computer from potential infections, you have to remove Best Save from your system today. When you need to deal with a program that is installed on your computer and you have no idea how the application entered your system, it is only natural to believe that you have been infected with malware. Nevertheless, as mentioned above, Best Save is not a direct computer threat because adware programs do not infect or steal anything directly. You probably installed this application onto your computer willingly because Best Save usually arrives bundled with freeware. Hence, if you have recently installed some new application downloaded from a third-party source, it is very likely that Best Save came with it. Best Save is directly related to TicTacCoupon, LuckyCoupon, SharkManCoupon, and other programs based on the JustPlugIt engine. These adware applications cannot be distributed directly, so they spread around in the InstallRex, Vittalia, and Amonetize installers. The installation file is usually hidden behind fake download buttons in torrent and various file-sharing websites. This means that you can avoid downloading and installing Best Save on your computer if you acquire programs only from their official websites. 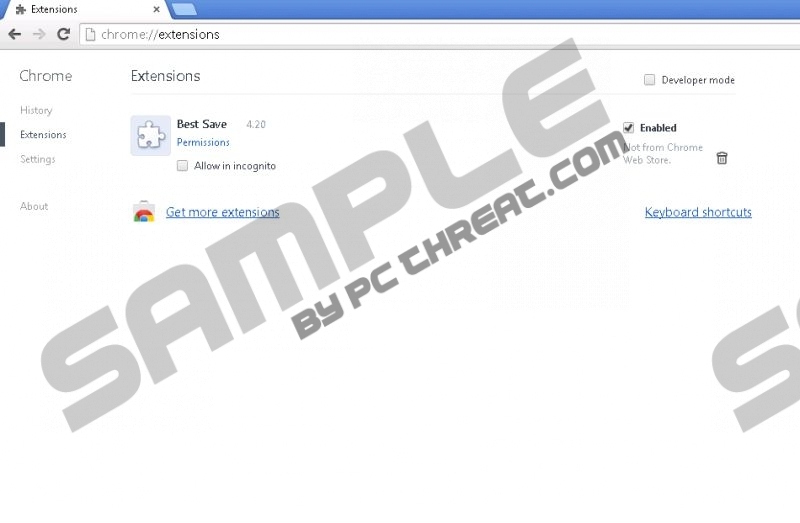 When Best Save enters your computer, this program adds extension to Mozilla Firefox, Google Chrome, and Internet Explorer. The extension may not work on the newer Google Chrome versions because the browser blocks this app. However, even in that case Best Save still remains on your computer, and it can continue gathering data on your web browsing habits. This data is used to generate customized advertisements that cater to your likes and preferences. Nevertheless, users are advised against clicking Best Save ads. You can never know what website you will be redirected to when you click any of the ads. Best Save does not check whether the outgoing links in the ads are safe. Hence, you need to protect yourself from potential exploitations on your own. Uninstall Best Save via Control Panel and invest in a licensed antispyware tool to check whether you have more unwanted programs in your system. Do not hesitate to remove them all automatically if need be. Move the mouse cursor to the bottom right of your desktop. Open Uninstall a program and remove Best Save. Select Add or remove programs and uninstall Best Save. Go to Extensions and remove Best Save from the list. Disable and remove Best Save from Extensions. Quick & tested solution for Best Save removal.